Between the two Cover Girl displays I shared in my big display post last week, I picked up all nine of the Glosstinis shades that are a tie-in with the Hunger Games Catching Fire movie. Top row: Sulfur Blaze, Flamed Out, Rouge Red, Inferno. Bottom: Pyro Pink, Violet Flicker, Seared Bronze, Scalding Emerald, Black Heat. All of these are microflakie/flecked shimmers. These bottles are small, holding 3.5 ml (.11 fl. oz. ), so I went with Skittles swatches in the interest of not making such a big dent in them. For the top row of colors, this actually worked out quite nicely as an ombre. I just need to figure out what to do on my thumb to complete the look for a full mani. 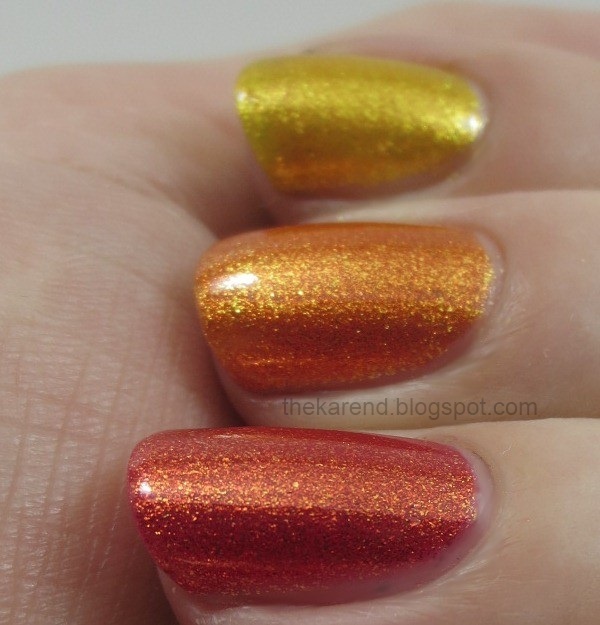 Top to bottom: Sulfur Blaze (yellow), Flamed Out (orange), Rogue Red (orange red), Inferno (deep orange red). All are two coats, no topcoat. 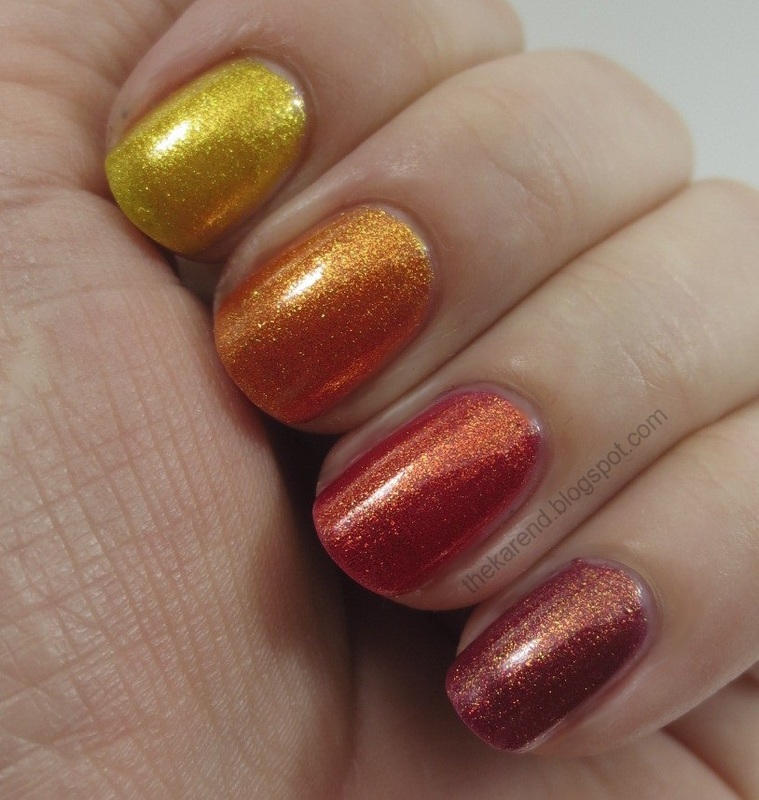 Inferno has golden and orange microflakie shimmer in its deep orange red base and just looks like autumn to me. 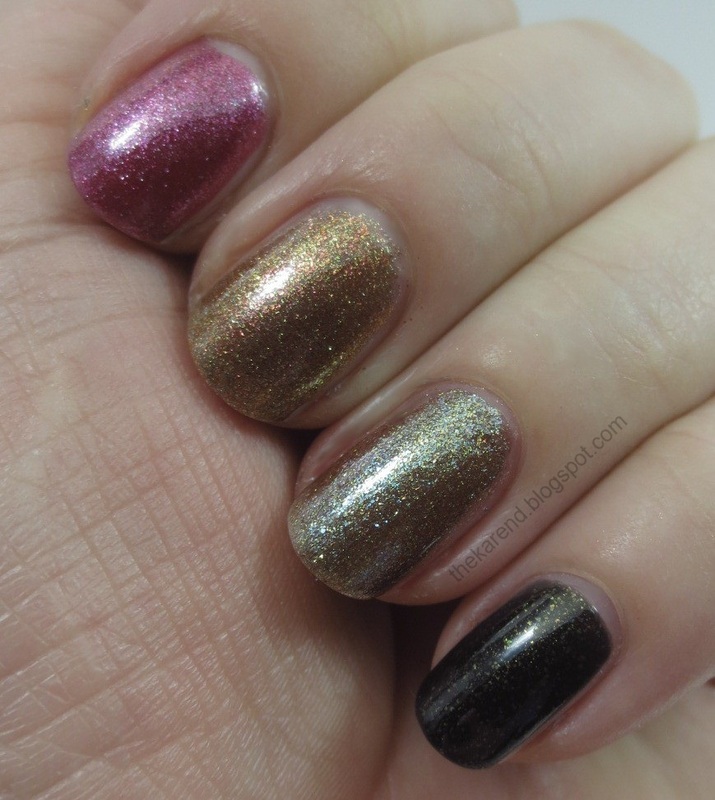 For the second quartet, I chose (top to bottom below) Pyro Pink (berry pink), Seared Bronze (coppery old gold), Scalding Emerald (olive brown), and Black Heat (black olive). These were also two coats, no topcoat. I liked the multicolor microflakies in Seared Bronze and Scalding Emerald but was sure I'd seen these combinations before. Sure enough, I had. 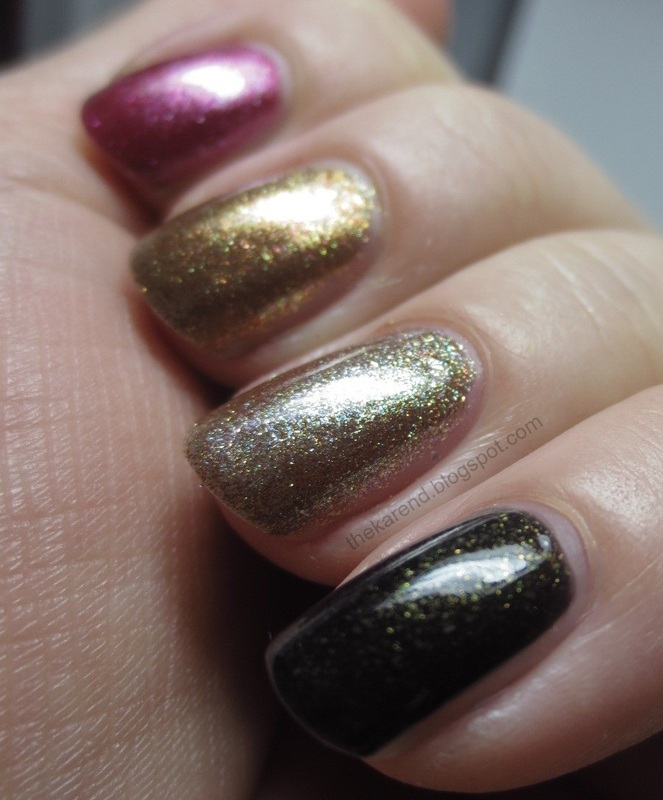 Left to right below: Anise Gilt Trip (brand is available at DSW, the shoe store), Cover Girl Seared Bronze, Cover Girl Scalding Emerald, Estee Lauder Explosif. 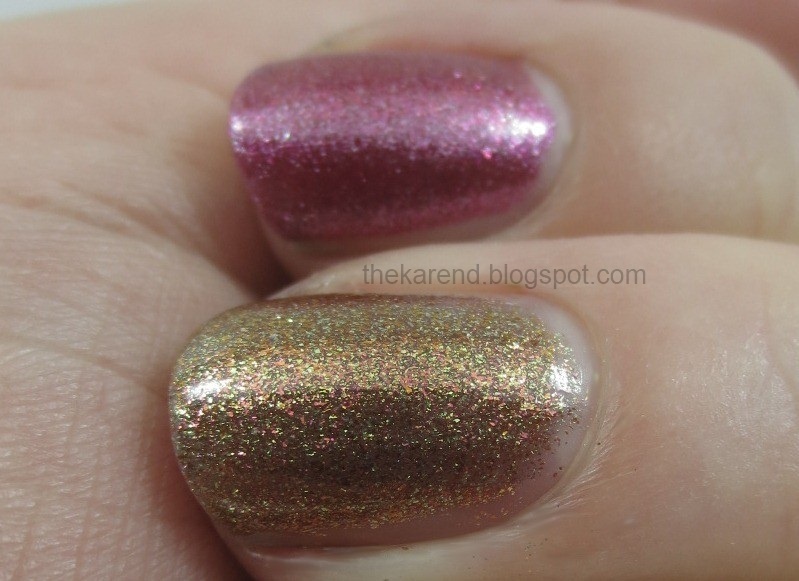 I had a hard time telling the Cover Girl colors apart from the dupe candidates I pulled from my stash. The Anise is maybe a tiny bit darker than its CG counterpart, and the Estee Lauder perhaps a smidge yellower, but not much as you'd notice at a glance. 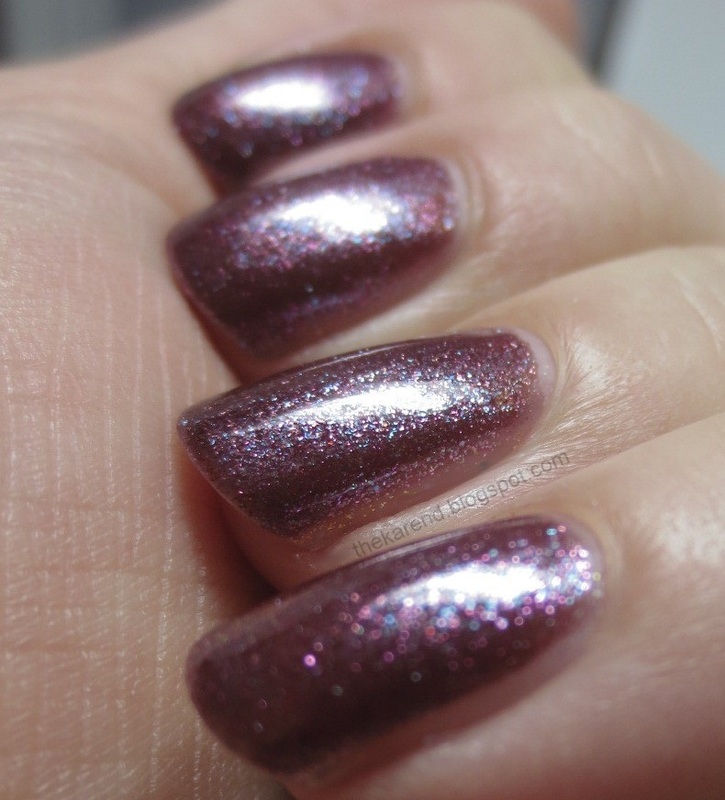 Since purple is my favorite color, I saved Violet Flicker for a full hand swatch. Like the previous shades, I used two coats, no topcoat. 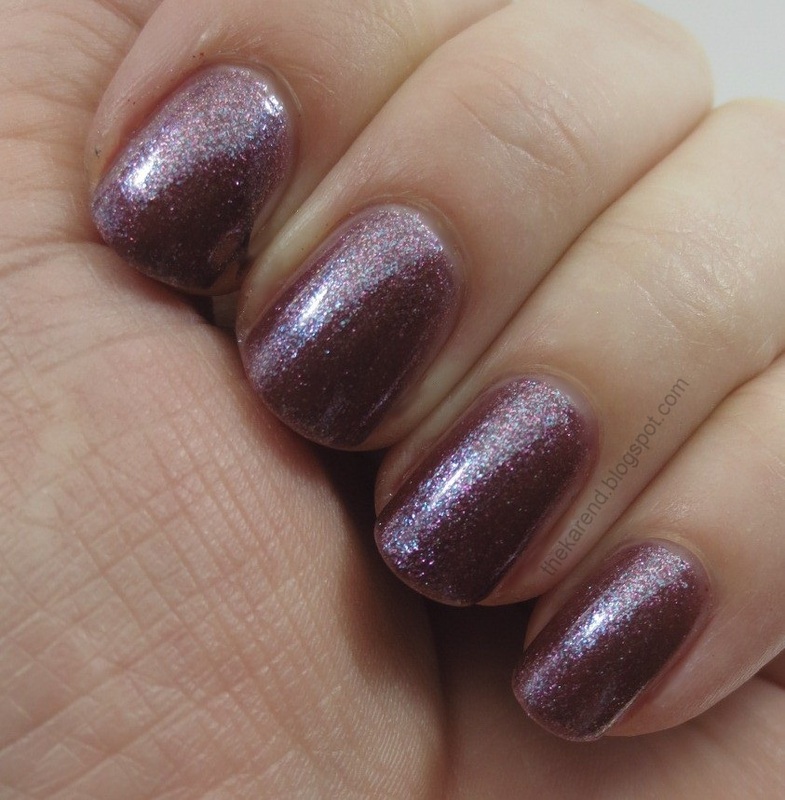 Violet Flicker is a warm plummy purple with blue and pink shimmer. I was quite taken with this one; I wouldn't be surprised if it makes it into my Top 20 for 2013. Overall, this is a nice collection. I think most people could find at least one flattering color here; there's a nice range from brights to classic colors to quirky ones to a deep dark. I just wish the bottles weren't so small. I've already bought an extra Violet Flicker (I figure it doesn't really violate my "no backups" policy if the total volume doesn't exceed one standard 15ml bottle). I'm a bit confused about why there were only four colors in one display and nine in the other, especially when there are 12 Districts in the Hunger Games (this is one time a big 12 color collection would make perfect sense). Perhaps more displays with still other Glosstinis colors will pop up as the movie release gets closer, but I don't think that's the case based on poking around the Cover Girl Capitol Beauty Studio website. The two looks that are unlocked now (there's one for every District) show colors in the Nail Look section from the Outlast line, not any of these Glosstinis. Guess we'll have to wait and see; the other looks unlock on October 1, 3, and 7.
o0o0h, These colors are very pretty!! hmmm I was trying to avoid these but I kinda dig them. I don't approve of the smaller bottles though. 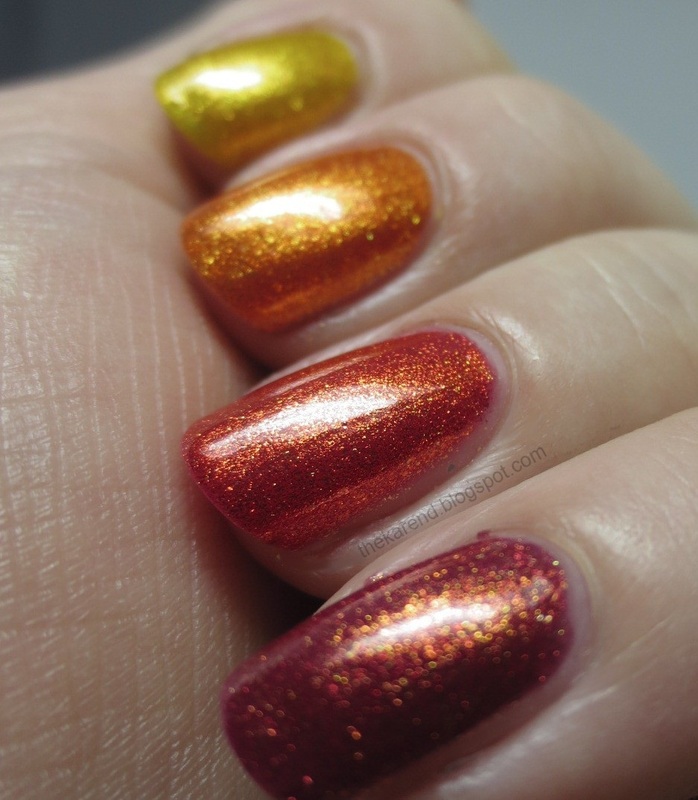 The first four is very similar to OPI's Burlesque Collection, they're identical! OO I love these! They all look great on you and I am such a sucker for shimmer!!! Hmmm I don't think I have ever bought CG polish. I love the first 4! I love the first photo of swatches, but the rest of the collection is pretty meh. I liked the collection with china glaze better! I haven't seen these out yet; I'll have to watch out for them! Lizzy, hmm, I'm not sure. I've certainly done similar posts but can't think of one just like this. Maybe one of the Zoya collections came close??? Oh geez. I don't know which of these I like the most, they're all so gorgeous! Especially that shimmer in Inferno! The orange ones are quite beautiful! I bought Black Heat, Scalding Emerald, and Rogue Red - none of the others really screamed at me - although looking at them at home I'm pretty sure I have something close if not identical to Black Heat and Rogue Red. The small bottle size is ridiculous, especially if you buy them at a drugstore like CVS or Walgreens where they tend to be priced higher. I don't know what CoverGirl was thinking when they okayed this. I'd buy them all, as a Hunger Games fan ♡_♡ , but I think I could skip olive, bronze and black: as I like flakes and I already own similar polishes. I like several of these, and the first quartet works wonderfully as an ombre. A great post, the first I have seen with all of them! 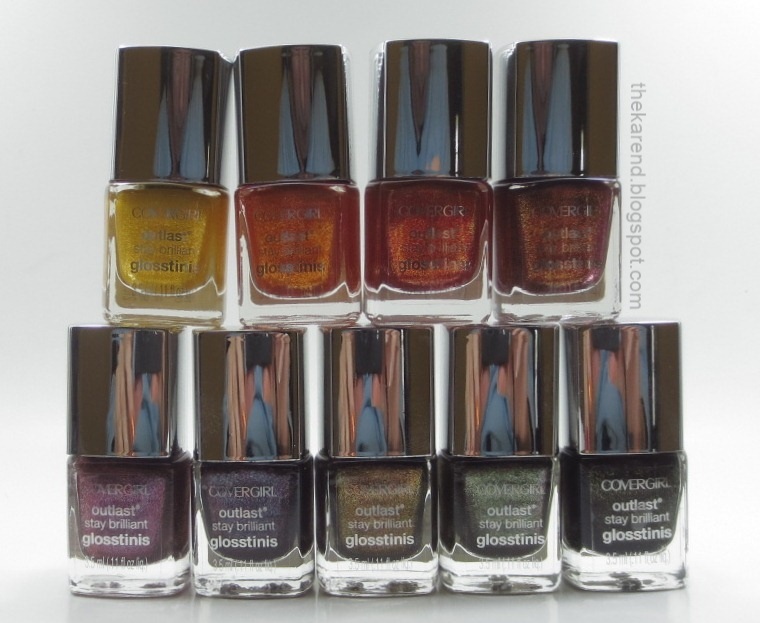 The bottles are so tiny, but the polishes look gorgeous! These are so gorgeous!!! Gotta love flakie shimmer. Emma, I got them at Meijer, a Michigan-based chain that has stores in a limited number of states. I'm guessing these additional colors will start showing up other places soon. These are prettier than I thought they would be. I still have not been able to find any of them in any of my local stores yet. They have them all at CVS.The Wags only has 4.The Meijers only has 6 and I think CVS may have more than 6.I didnt check really good.But grab whats at Wags because they are buy1get1 50% off right now. lollopopmissfit, the displays at every Meijer I've seen have had all 9 colors. I'd be curious to see the 6 color display at yours if you got a photo. As soon as I saw the first ad for this collection, I knew that I had to have it! So when I notice that Wal-Mart had the Hungergames nail polish, I started buying! My first four were the : Purple, both Reds, and the Black! I love, Love, LOVE these colors, and can't wait to get the rest of them! So, ...., looks like I'm going back to do some more nail polish shopping!!! HAPPY-HAPPY/JOY-JOY!! !